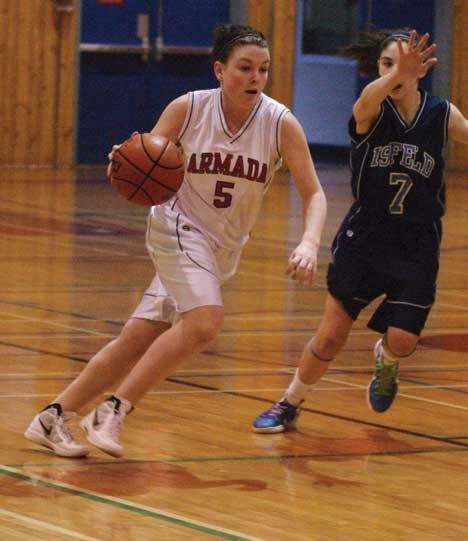 The Alberni Armada senior girls hoops team is the No. 2 seed at the North Island championships, which are at ADSS this weekend. Feb. 16, 2012 6:00 a.m.
Armada junior girls guard Julia Hudson advances the ball in a game last Saturday. The juniors are competing in the North Islands this weekend. The time of year that counts most is here and the Alberni District Secondary School Armada senior girls basketball team is ready and waiting. The Armada are competing as the No. 2 seed in the North Island championships, which are being played this weekend at ADSS. The Armada are competing against No. 1 seed Dover Bay, No. 3 GP Vanier and No. 4 Cowichan. The top three teams advance to the Island Championships next week. Dover Bay is the team to beat, and head coach Greg Freethy sees the Armada squaring off with them in the final. The Armada are 2-1 against the Dolphins this season and won their last meeting against them.“They’re quicker, we’re bigger, they fast break, we have in inside game,” Freethy said. Beating Dover and winning the number one seed will take a solid post play, stellar rebounding and containment. The Armada have all players back from injury except for Paige Hansen, who is still out with a knee injury. The team last saw action in a league game against GP Vanier, which they won. The team placed third at the North Island’s last year and seventh at the Islands. The team’s goal this year is to win first place. “I don’t remember the last time Alberni won the North Islands,” Freethy said. The Armada junior girls are competing in their North Islands Championships in Courtenay this weekend.